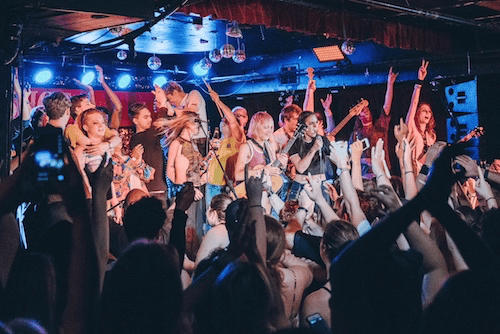 4 July 2018 (Toronto, ON) – Juno Award winning bands The Beaches and The Elwins recently hosted Avril Night covering their favourite Avril Lavigne songs and featuring performances by: The Beaches, Birds of Bellwoods, Brave Shores, The Darcy’s, Goodbye Honolulu, Kyla Charter, Leah Fay, Luna Li, NEFE, POESY, Taylor Knox, Tyler Shaw and VALLEY. The event raised over $10,000 with all of the proceeds being donated to The Avril Lavigne foundation. Founded in 2010, The Avril Lavigne Foundation supports people with serious illnesses or disabilities. Through programs and grants, the foundation provides funding, education and encouragement for their beneficiaries to pursue their dreams, no matter what their circumstances. “Avril Night was an idea that stemmed from our band’s mutual love and admiration for Avril Lavigne. I like to blast Avril tunes while I drive, so while on the road in the Fall we basically screamed along to the classics and deep cuts and while chatting (in between songs) we all came to the realization that when we were kids, Avril was our biggest influence for wanting to learn our instruments in the first place. Having our friends join us to perform our favourite songs seemed like a great way to celebrate Avril and the amazing work that her foundation does.” Said The Beaches’ Leandra Earl. Juno award winning, Toronto based band The Beaches are 100% rock and roll. Comprised of sisters Jordan and Kylie Miller (on lead vocals/bass and guitar, respectively), Eliza Enman-McDaniel on drums, and Leandra Earl on keys and guitar, the band has a natural kismet that shines through on each of their tracks and in their live performances. After two self-released EPs, The Beaches unveiled their debut album Late Show in October 2017. Late Show consists of 12 tracks and was recorded in Toronto and produced by Emily Haines and Jimmy Shaw of five-time Juno Award-winners Metric and mixed by multi-Grammy Award-winner Tchad Blake. The singles Money and T-Shirt were both great successes at radio with T-Shirt securing #1 for three consecutive weeks on the Billboard Rock Chart. Last year, The Beaches accompanied Death From Above on their North American Tour. This year The Band headlined their first ever national tour and have been invited as a supporting act for the Foo Fighters on their Toronto show in July.